We all want to grow in our walk as Christians. We've talked about how often we read God’s Word close the book and forget what we’ve read. We can blame our memories or our intelligence or our age, but the reality is it has more to do with our method than our abilities. 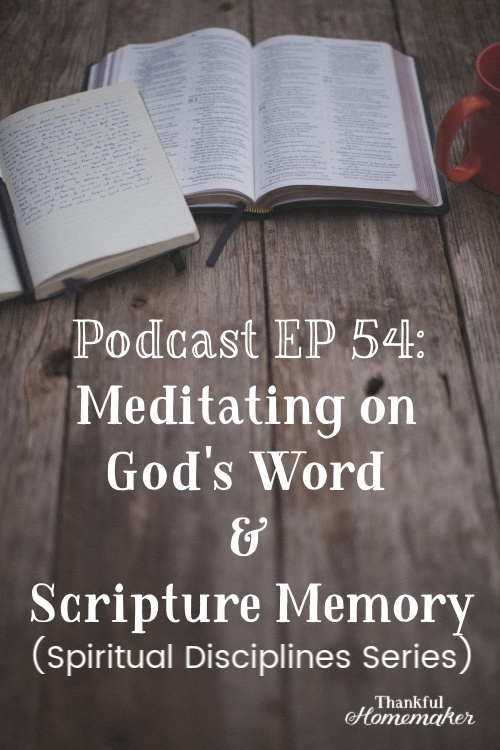 Today's podcast episode is going to address areas that are important to our growth as believers: Meditation on God's Word and Scripture Memory. God desires us all to grow in the grace and knowledge of His Word, so we are all capable and equipped as believers by the work of Spirit of God in us. We talked in our last episode on bible reading that we need to read the Word and hear the Word preached but just doing those two things doesn't always guarantee we will remember or be able to apply what we read. So then we briefly touched on meditating on the Word because this is where growth starts to come about. When we talk about meditation, please don’t get the image of a yoga class or some other kind of New Age practice. What the world describes as meditation is not what Christian meditation is. Again we are not emptying our minds, but in Christian meditation, we are filling our mind with God and His truth. We all know we need to hide God’s Word in our heart so we might not sin against him (Psalm 119:11) but do we ever get to actually doing this? We know there are many benefits to having the Word of God in our hearts: to speak truth to our hearts, battle against sin, speak truth to others, and witnessing to others. A reason I want to remind us of to think of first—is that it is the very Words of God are shaping our minds and hearts when they are in our memory. We are able to think God’s thoughts throughout the day—transforming our minds with the truths of God’s Word will help us in discerning the will of God. Memorization and Meditation seem to work together in the spiritual disciplines. The hope is that we are meditating on the verses we are memorizing so we understand the meaning and context of the verse so we can apply them properly. Journals: Just Give Me Jesus from @Well Watered Women & Abide Journal from @Daily Grace Co. Gospel Verses from Habits of Grace: Mark 10:45, Romans 5:8, Romans 6:23, Romans 8:1, Romans 8:32, 2 Corinthians 5:21, 2 Corinthians 8:9, 1 Timothy 1:15, 1 John 4:10, Revelation 5:9. I plan to use the Spiritual Disciplines series for our bible study/fellowship. We have one member who is deaf & was wondering if you have a pdf file of the study notes so that she can participate? We will be doing Episode 52 on next Thursday, April 11th. I appreciate your help concerning this matter. Tina I’m going to shoot you an email.